The one story about Sif that stuck with me is the one story about Sif that anyone is likely to know–if they know the name at all: how Loki cropped the hair from her head; and then to assuage Thor’s anger, tricked the dwarves into replacing Sif’s hair with strands of gold. It’s a good story, but it has less to do with Sif than it does her husband’s reaction to Loki’s deeds. It’s also less about Sif’s new golden hair than it is about the other gifts Loki won from the dwarves, namely: Thor’s hammer Mjölnir and Gungnir, Odin’s spear that never missed. Loki played another prank on Sif–one that D’Aulaires’ Book of Norse Myth sure didn’t talk about when I was a kid–he claimed to have had an affair with her. 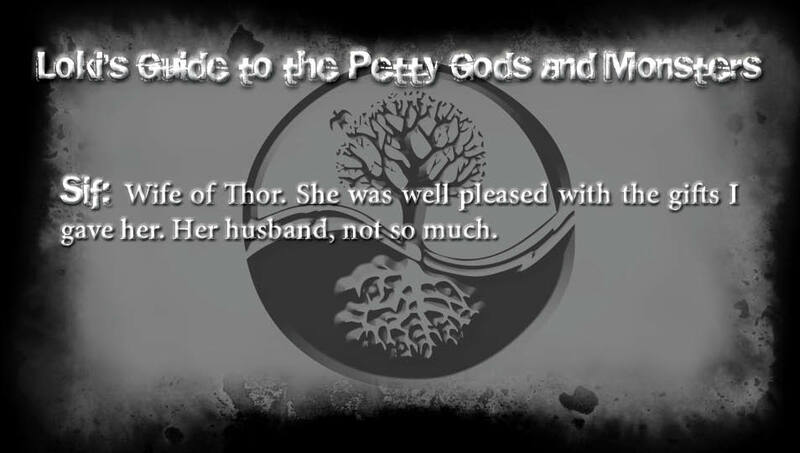 We don’t know Sif’s reaction to this, but in another story, the possibility of Sif having another lover is something Thor admits is “what seems worst to him.” So once again, it’s more about Thor than Sif (interestingly though, Thor is occasionally referred to as “husband of Sif” which seems progressive for the time). Thinking on this, the character of Sif is one of the few instances where I prefer her portrayals in other media. In my old Dungeons and Dragons (if you’ve been reading along, this revelation can’t really surprise you) manual Deities and Demigods, Sif is portrayed as Thor’s wife, but also as the goddess of skill and excellence in battle. I like that. In Marvel’s Thor comic (and the Thor movie) Sif is also portrayed as a warrior (and a brunette), a lover of Thor, but not his wife (good thing too, comic book wives don’t tend to work out so well…), someone who could be Thor’s companion, his equal. Now that she has a starring role coming up in Thor’s old comic title Journey into Mystery (a young Loki just finished headlining this book) written by Kathryn Immonen and illustrated by Valerio Schiti, maybe she finally will be.